September Fish of the Month Entry - Seven Skate! September Fish of the Month Entry - Blue Trout! Mikael Frodin Confirms for GAC September Event! Meet Sportquest at the GAC Open Weekend! September Fish of the Month Entry - Finnish Pike! Hardy Greys Distance Casting Event at GAC! Davie McPhail Confirms For GAC Open Weekend! GAC Reward Card Scheme - Members Only Pre-Sale! September Fish of the Month Entry - Irish Carp! September Fish of the Month Entry - Leven Salmon! See Daiwa at the GAC September Open Weekend! GAC Autumn Open Weekend Event 2013! September Fish of the Month Entry - Monster Blue! The Savage Gear 3D Trout has Arrived! September Fish of the Month Entry - Local Pike! September Fish of the Month Entry - Drain Pike! Patagonia Gear now in stock at GAC! Guideline LPXe MicroWave Spin is Coming to GAC! The long awaited new addition to the Savage Gear 3D lure range has arrived in stock at GAC! We now have the new 3D Trout Rattle Shad in all colours and sizes but please be quick because, as with all new SG products, demand will be high and these will sell out fast! 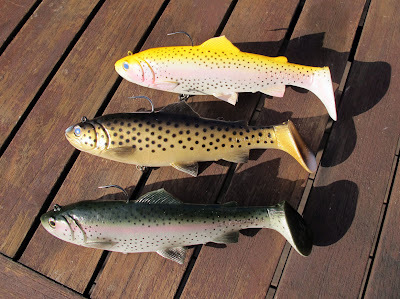 The new 3D Trout from Savage Gear - Now in Stock at GAC! Ever since we first saw these in June and tried them for ourselves we were sure these would be a big hit and we have been inundated with enquiries! If you pre-ordered yours in advance (very sensible) they will be with you very soon! We also have the new 2014 colours of the best selling SG Real Eel in stock too and they look fantastic! 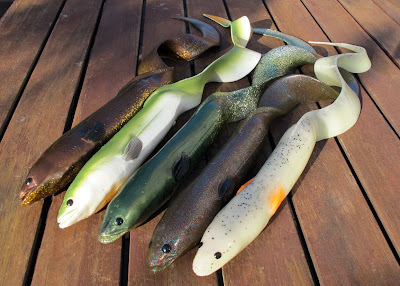 The fantastic new colours in the Savage Gear Real Eel! Available now from GAC! To purchase these amazing new lures simply visit us instore or online while stocks last, and be sure to share your catches with us on our Facebook Page now that the Predator season is in full swing!